When visiting the Ventnor Historical Society Museum in 2013, Redvers left a note and these two photographs relating to his time at the Down Lane domestic site. He tells us that he was in B1 billet next to SHQ, having been posted in after serving for three years as a Fireman in the Suez Canal zone and whilst at Ventnor he was promoted to Corporal. He recalls that the CO was Flt. Lt. Jeffries, that the Adjutant was a Maltese ex-pilot who owned two dogs and that Flt.Sgt. "Mundy" was acting SWO. Sgt.Temby was in charge of six police including dog handlers. Besides himself there were two other Geordies on the site, a Corporal in the cookhouse and a policeman who married a local girl and stayed on the Island. 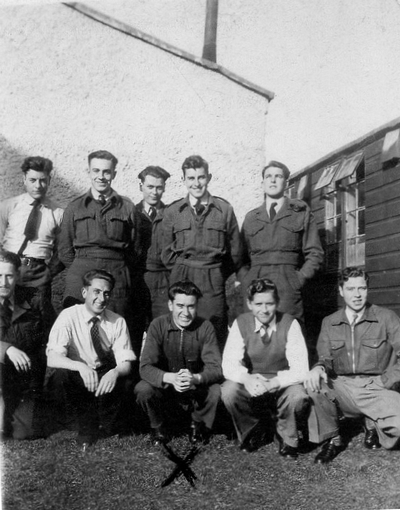 His friends were Johnny (Radar) Nunn, Tommy (Postman) Boswell and Hank Highfield, a MT mechanic. In the photo the second man from the right was the Pay Clerk. Also recalled is a Cpl.Marshall, a radar fitter. There was also an Islander who hailed from Shanklin in his billet. 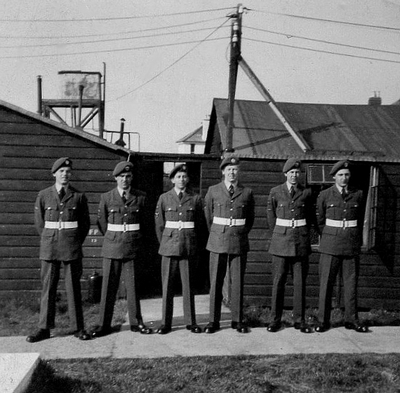 As with most of the RAF lads, the Winter Gardens was a very popular venue. An abiding memory is that he found the local people very friendly.